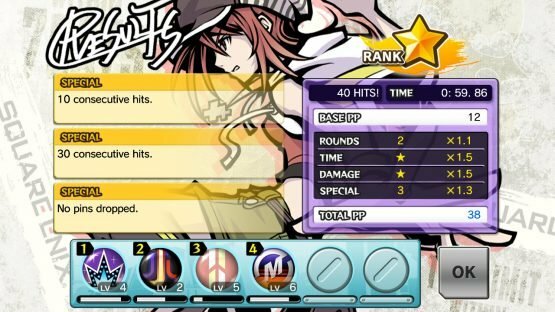 You might have heard of The World Ends With You even if you have never played the game yourself; the characters of the game appeared in Kingdom Hearts, the original DS game was controversially ported to mobile, and the game was announced to be coming to Nintendo’s zeitgeist handheld back in January. So, being a fan of the game and having played it way back in 2007, I relished the chance to play this game again and find out whether it has held up. 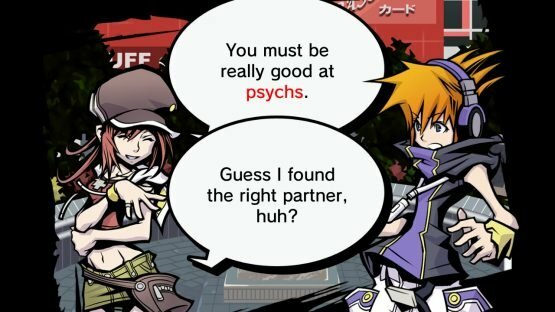 The story of The World Ends With You is part high-school drama, part pseudo-Sci-Fi Japanese nonsense, and is both of these aspects in the best possible way. The player controls Neku, an antisocial misfit with unbelievable amounts of angst and trust issues, thrown into an alternate world version of Shibuya, Tokyo and instructed that he has (against his will) been entered into a phenomena called The Reaper’s Game. The Reaper’s Game is played over 7 Days with a simple enough ruleset; complete the mission given each day or be erased from existence, if you successfully survive you earn the right to be alive again. There’s a catch though, you cannot play alone and have to form a pact with another Player or else you cannot hope to survive. 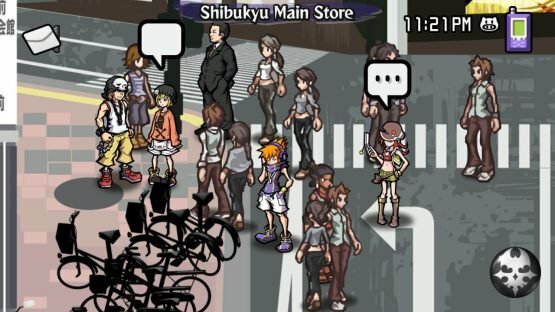 So, very shortly after awakening in this intensely fashionable purgatory, Neku meets Shiki and the Game truly begins. The story unfolds through a series of cut-in, stylised dialogue boxes, interspersed with flashbacks and with the occasional cut scene thrown in for good measure. Needless to say, the narrative borders on the absurd most of the time, crossing over into the truly ridiculous on occasion. But, the story does unfold at a pace that is very easy to follow, with new plot threads and characters being slowly and succinctly eased in. You can also scan any given area with the Player Pin and read the thoughts of the people, building the world up even further. 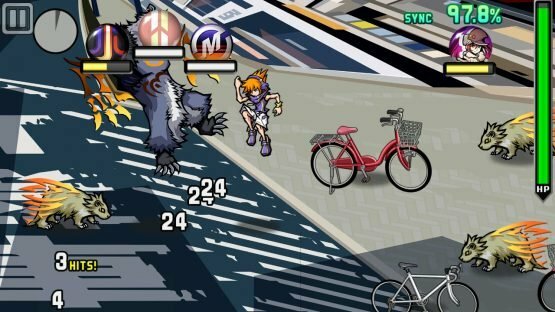 The World Ends With You has a staggering amount to consider when it comes to gameplay, with the game throwing a rather large amount of different mechanics at the player throughout. First and foremost though, the player will be running Neku around Shibuya, solving the problems of denizens, completing smaller objectives for Reapers in order to progress, and fighting Noise both to finish missions and just for fun. How to play the game is down to you, with two main control methods available, touch screen and pointer controls using a single Joy-Con. The touch screen controls, which are easily the superior way of playing, will be familiar to those that have played the Nintendo DS and mobile versions, controlling Neku using simple touch gestures. This is easily the most precise way to play the game, both in combat and out. The docked or tabletop mode requires the player to point the Joy-Con at the screen. Using the Joy-Con allows movement outside of combat with the analog stick, which is wonderful, but in combat using the pointer results in some unusual mistakes and slightly hackneyed movement. Sometimes what the player is trying to do just won’t register correctly or quick enough, and in a game this frenetic, that’s a definite bad thing. Speaking of which, the combat is a glorious mess, which admittedly takes a little while to get used to, but once it clicks is unbelievably intuitive. It revolves around ‘Pins’, which are badges that have different abilities depending on their design; some will create fire, some will fire beams, and some will even manipulate objects in the battle. All of these are enacted through either motion or touch depending on your chosen control method; the beams for instance are used by tapping/clicking on the enemy you want to hit. Each of these pins has a cool-down after a certain amount of uses, which appears once the pin is used up, and some of them have a cool-down at the beginning of an encounter. All of this information can be found on the Pins part of the menu, and actually results in a decent amount of strategy as you decide which pins are best for both you and for the scenarios you’re currently dealing with. Furthermore, pins will level up through use and grow stronger, sometimes also growing into new pins, which they will do for a staggering variety of reasons (like having different types of PP fed into them). As there are a couple of different ways of gaining this PP, including the incredible fact that you gain it whilst not playing the game up to seven days, you need to experiment to work out how much of the different PP forms you need to evolve the pins. Also, you have a second character with you at all times, that have cool-downs like the rest of your pins, and tapping on Noise will cause them to attack. If you time these attacks with your own, you will Cross Combo (the Noise flashing blue) greatly boosting your Sync rate with your partner. Once this Sync rate reaches maximum you can tap the large pin in the top-right activating a devastating Fusion, attacking all enemies and restoring a little HP. There’s also the option, should you choose to activate it, to have two player co-op in combat. This gives the other player the ability to control the other character and makes battles so much easier. As it alleviates the need to time your attacks with the other character, it makes getting a Cross Combo far easier, and also really allows far easier crowd control especially as it’s couch co-op so you can fight tactically. Be careful, however, as both players share the same HP bar in this mode, and there’s two targets for Noise to hit. As a final element to the combat that is incredibly interesting, the player can reduce their level at any point in-game. 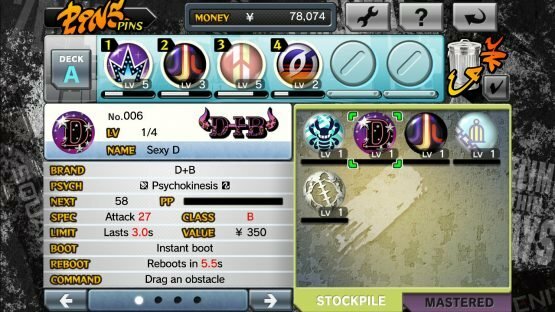 This will make the battles far more difficult, especially the boss fights, but yet will increase the yield of ‘bling’ that you receive at the end of the battles as well as an increase in EXP for the player and PP for their badges. So, it’s kind of the ultimate risk/reward mechanic, and one that the player doesn’t even need to touch at all if they don’t want to. Combat isn’t everything in this game, however, with a quite extensive amount of other layers to the gameplay to consider, the most important of which is the brand system. This mechanic, viewable from the menu (which is your phone, of course), will denote that certain brands are popular or unpopular in the area you’re currently in. If you’re wearing the correct brands, you’ll receive a stat boost in that area, if not it will work to your detriment. So you’ll have to stay in style to remain powerful, which is gloriously stupid. Continuing on our quest of tying the game up in a wonderfully over-stylised package, is the unorthodox way that money and shops work. You receive Yen as Pins that can be sold as ‘bling’ from battles, that can then be spent in the numerous fashionable boutiques in Shibuya. Most of these are one of the brands and you can buy Pins, attire and Stickers from them. The interesting feature in this is that you can build a rapport with the assistant of that store by browsing and buying, and in doing so you unlock the hidden abilities of the items in that store. As a final little layer to the gameplay, there is the mini-game Tin Pin Slammer. This little game has enough depth really to warrant a small review on its own, and has the player choosing six pins to pit against three other players for supremacy. The whole idea is to knock your opponents’ pins out with ‘Whammies’, or special moves, and the last player standing is the winner. A word of warning, this little game is highly addictive and will be a massive time-sink, but it is just so enjoyable and satisfying to play. 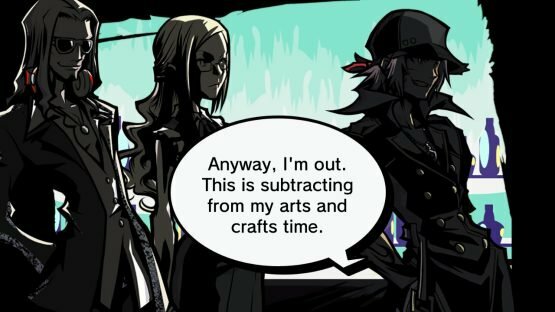 Visually, The World Ends With You is absolutely gorgeous, opting for a more stylised, cel-shaded art style that works tremendously well with the high fashion, high concept drive of the rest of the game. The visuals in the game are definitely the same ones from the mobile port, which are the high definition version, but that means that the whole thing looks sharp, crisp, and as edgy as the protagonist. All of the areas of Shibuya are not only distinct from one another, but also are designed in such a way that they actually retain the feel of the areas that they are based on. Hachiko Statue is not only in the same rough area as the real life counterpart, but also retains the feeling of importance and reverence of the real thing. The whole gameworld is highly stylised with accented eschewed perspectives, but still grounded in reality to an extent. The character designs are absolutely incredible, with pretty much every character falling into the bracket of being over-dressed, sassy fashionistas. All of the characters, even if written as one-dimensional tropes at points, feel like distinct individuals almost entirely based on just their looks. Factor this in with some incredibly snappy dialogue between all of the cast, and you get a game that is absolutely consistent in its image across all aspects. In terms of sound, the soundtrack of this game is one of my personal favourites of all time, combining upbeat and punchy dance tracks with mellow and dark effects or lyrics. Also, as a bonus, the Final Remix has an entirely remixed soundtrack too, so the entire thing still sounds fresh regardless of how much time has passed. However, if that isn’t for you, there’s the option to switch between the original and remixed music at any time in the menu. But, truth be told, both versions of the soundtrack are incredible, so you can’t really lose. Whether or not I can recommend this game really does depend on how much weirdness you can handle. From the mechanics, to the visuals, and story, there is very little in this game that isn’t at least a little odd. Personally, I love this somewhat over-stylised carcrash, but I can totally understand why others wouldn’t. The controls are somewhat awkward, the plot at times slightly ham-fisted, and the visual style isn’t for everyone. However, when it comes down to it, The World Ends With You is fantastically weird and wonderful; full of quirky mechanics, flamboyant characters, and heaps upon heaps of style, and I’m glad that more people are now able to play it owing to the Switch. It might take a little while to get used to, sure, but I wouldn’t have it any other way and cannot wait to see if this game is a segue into a sequel.